The church is well preserved. 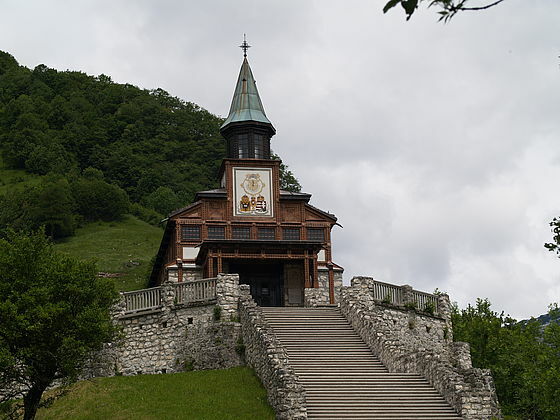 The memorial church of the Holy Spirit stands in an exceptional natural environment of the Julian Alps, above the alp Polog. The construction of the church was closely connected with the events on the Isonzo Front. 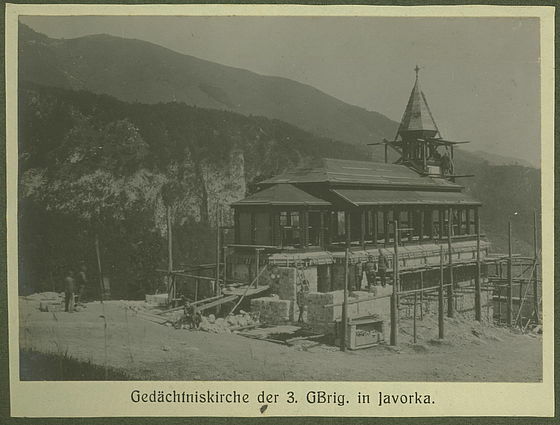 Namely, between 1916 and 1917, the soldiers of the 3rd Austro-Hungarian Mountain Brigade were building it with their own hands and with the support of donations in memory of their dead comrades. It was erected on the location which was approximately equally distant from the most important fighting positions of the brigade on Mt. Vodil vrh, Mt. Mrzli vrh, the ridge Sleme and Mt. Rdeči rob. The idea of the memorial church is best presented in the oak boards, which open like the pages of a book along the walls of the church. The soldiers burnt in the names of 2565 killed comrades who had lost their lives in the surrounding mountains into this “book of the dead”. Most of these soldiers are buried in the military cemetery at Loče near Tolmin. Today, it is not only a unique artistic jewel, but it has also preserved the symbolic mission of peace. It reminds visitors of the horrors of the war and at the same time it also calls for reconciliation and for inner and everlasting peace. In the years 2007 and 2017 the church received the European Heritage Label. Cultural monument of national significance. If you would like to visit the church outside the opening hours you can get the key at TIC Tolmin (Ulica Petra Skalarja 4). The nearest bus stop is in the center of Tolmin (10 km away), the nearest train station in Most na Soči (18 km away). Little Museum of the Isonzo Front "Tolmin Bridgehead"